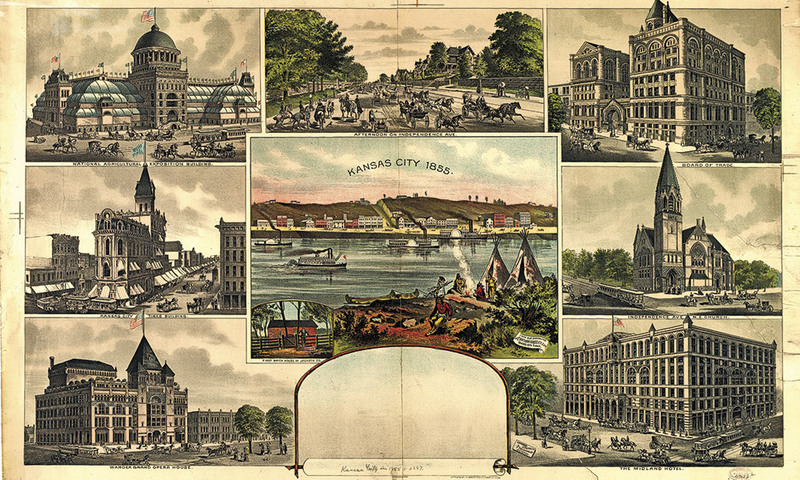 From 1860, when Kansas City, Missouri, had a population under 5,000, to 1890, when the city topped 132,000, the frontier-river outpost, which had grown into one of the nation’s most important cultural urban areas, boasted the National Agricultural Exposition Building (upper left), Grand Opera House (lower left), Board of Trade (upper right) and the Midland Hotel (lower right). If you’re a vegetarian, stop reading. Unless you like opera. We don’t think of cattle towns as cultural meccas, but many of them were. And still are. Take Kansas City, Missouri, for instance. By the mid-1880s, KC had a population of more than 500,000. Cattle, I mean. Yes, KC drew that much beef per year. The population of people topped 100,000. And pigs? We’re talking around two million hogs a year. Culture came to KC at the same time, thanks to Kersey Coates. In the early 1870s, the banker built an opera house at modern-day 10th Street and Broadway. The building burned in 1901, but KC still has culture (Kauffman Center for the Performing Arts, Nelson-Atkins Museum of Art). In frontier towns, opera houses weren’t just about opera. As George D. Glenn, an Old West historian, and Richard L. Poole note in The Opera Houses of Iowa, opera houses were “the heart of community culture,” where residents could see everything from Fidelio to Hamlet to sermons, medicine shows, debates and talent contests. As a cattle mecca, KC thrived, and while the stockyards closed in 1991, that history remains strong. The Livestock Exchange building is on the National Register of Historic Places, and KC is filled with museums. And the annual American Royal showcases livestock, horses, rodeo and—this being KC—barbecue. Incorporated in 1850, Kansas City grew exponentially after the arrival of the railroads in 1869. Soon thereafter, the Missouri River crossroads city became one of the most important economic centers in the Midwest. 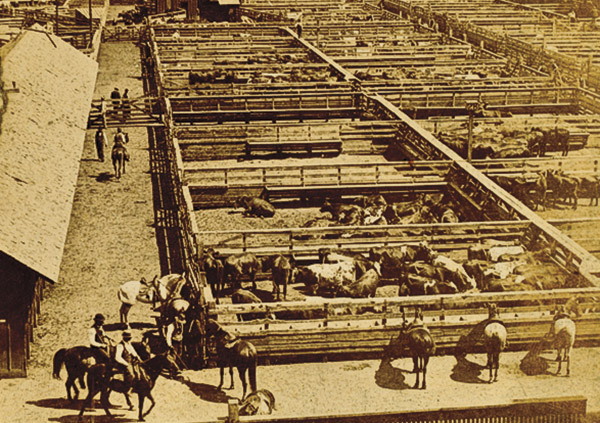 While Kansas City’s famous stockyards closed in 1991, from 1871 until a terrible flood in 1951, the 55-acre livestock center was only second to Chicago’s Union Stock Yards. In Kansas, Dodge City, where the feedlots are a tourist attraction, Ellsworth, Caldwell and Abilene celebrate the wild and woolly cowtown era, but Wichita blends the contemporary with history and culture. Incorporated in 1870, Wichita started out a decade earlier as a trading post. The arrival of the Atchison, Topeka and Santa Fe Railway in 1872 brought the Texas cattle trade. Wyatt Earp pinned on a badge here before civilization, quarantines and Dodge City helped drive the cattle trade West. In 1887, the Wichita Union Stock Yards Company opened for business, but seemed to be jinxed from the start. “Unfortunately,” J’Nell L. Pate writes in America’s Historic Stockyards: Livestock Hotels, “on the night of the opening, a fire totally destroyed the yards, burning two carloads of cattle and one hundred tons of hay.” The yards were rebuilt, complete with a hotel and exchange building, but the yards and hotel went up in smoke again in 1904. The hotel burned again in 1972. The stockyards closed in 1980. And the exchange building was destroyed 20 years later. When the Crawford Grand Opera House opened—folks paid 50 cents to $2 for the 1888 debut, a performance of Gypsy Baron—the Turner became a market house. The Turner was demolished in 1917. And the Crawford burned in 1913, but the vaudeville Orpheum Theatre opened in 1922, and still showcases events, including the Tallgrass Film Festival each October. This cowtown hasn’t lost its cattle roots (Old Cowtown Museum) or its culture (Wichita Grand Opera, Wichita Art Museum). First stop on the trail of the drovers who made Wichita rank with Abilene and Dodge City, Kansas—the cowtowns—is Wichita’s Old Cowtown, where you might be able to imagine the real Wyatt Earp walking the boards as a city policeman trying to keep the peace. Just a few years after Oklahoma gained statehood, the Oklahoma National Stockyards started in 1910 as Stockyards City. Before long, the area in Oklahoma City became known as “Packingtown.” Major packing houses built plants, as cattle, hogs and sheep arrived healthy and left…. The plants closed in 1961, but livestock sales began in earnest. Today, Stockyards City brags that it’s the world’s largest market for stock and feeder cattle. Cattle auctions are held Mondays and Tuesdays, and the district brings in cattlemen and tourists who can still shop (Langston’s Western Wear started in 1916) and eat as they have for decades (the Cattlemen’s Steakhouse opened in 1910). Meanwhile, Henry Overholser built OKC’s first opera house in 1903. The Overholser Opera House would bring in talent like Sarah Bernhardt and Lillian Russell. Warner Brothers bought the venue in 1928, and the theater showed movies until 1964. Eventually, it became—sadly—a parking lot. Still, OKC celebrates its cattle and culture at the National Cowboy and Western Heritage Museum, where the well-attended annual Prix De West Invitational Art Exhibition & Sale ranks among the West’s most prestigious art events. In 2015, Painted Sky Opera was founded to bring opera back to OKC. 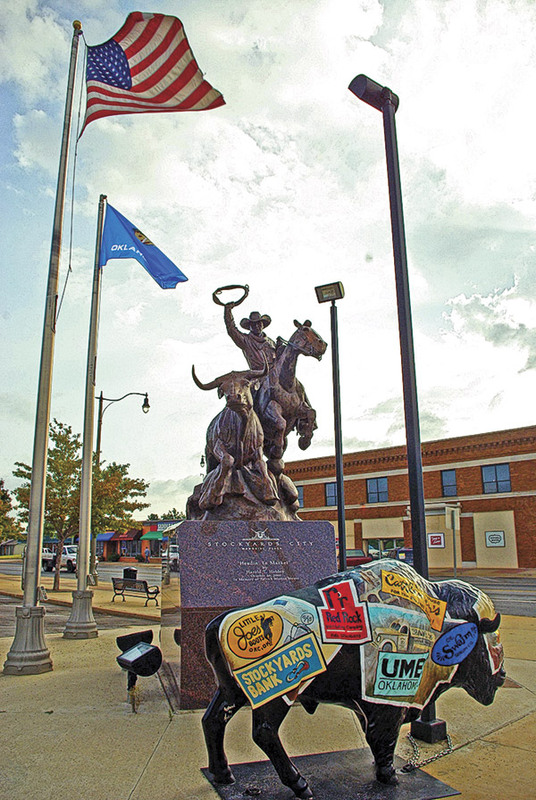 Oklahoma City’s Stockyards blend history, contemporary cattle markets and tourism, where visitors are greeted by Harold T. Holden’s bronze Headin’ to Market. Oklahoma City, Wichita and Kansas City owe Texas, so this cattle-culture trail heads to Fort Worth. 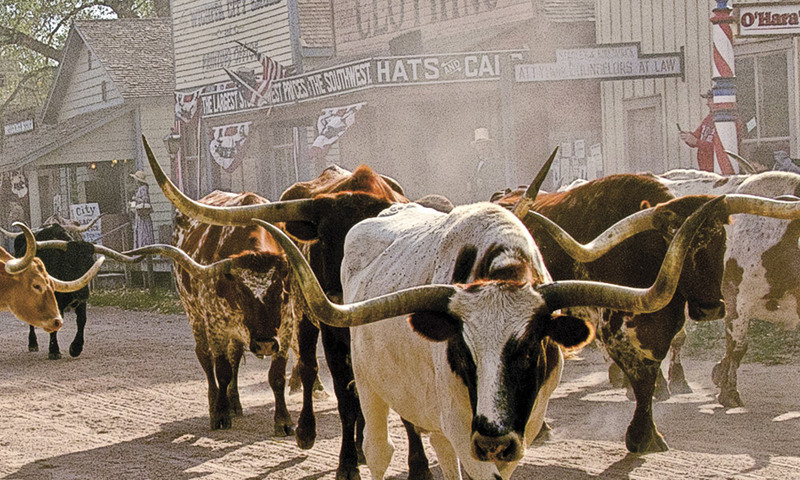 Cattle drives are a daily event for tourists at the historic stockyards. 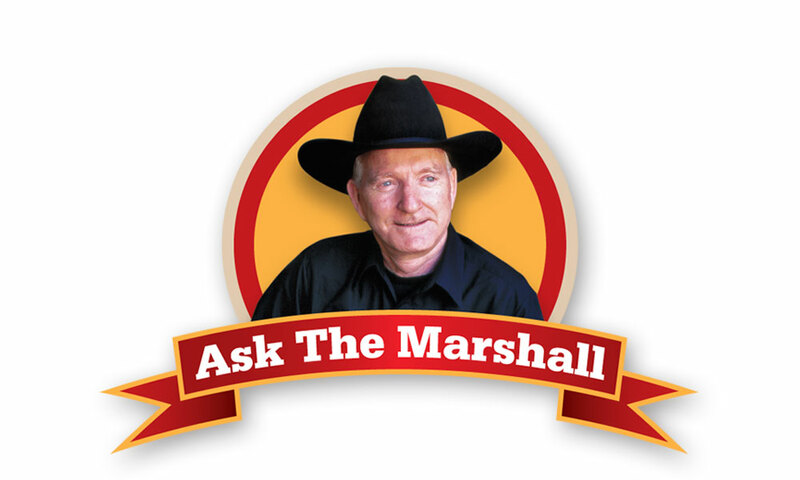 As a stop on the Chisholm Trail, millions of cattle trailed through the city. 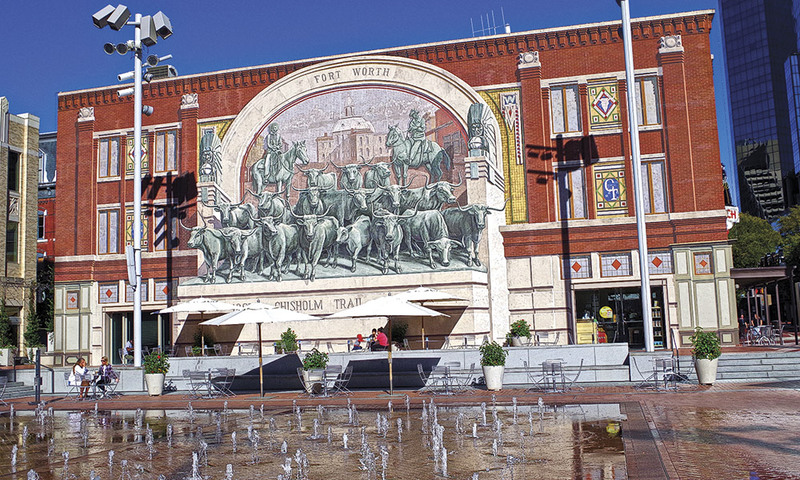 The railroad arrived in Fort Worth in 1876; Union Stockyards went up in 1887. In 1893, a Yankee capitalist named Greenleif Simpson bought the stockyards, which became the famous Fort Worth Stockyards Company. By the turn of the century, companies Armour and Swift had packing plants nearby. A coliseum, site of the world’s first indoor rodeo, went up in 1907. Theodore Roosevelt and Comanche leader Quanah Parker would step inside the coliseum. So would Elvis Presley. After the packinghouses had closed, the stockyards became a national historic district in 1976. Today, this mecca offers several shopping, eating and history options. You can even catch a rodeo or event at the Cowtown Coliseum. Before Fort Worth had a real opera house, it had real opera. 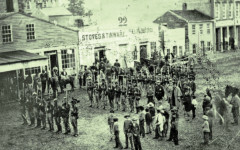 In 1877, the Tagliapietra Company performed Il Trovatore and La Favorita at Evans Hall—on the second floor of a general store. Cattle king Charles Goodnight built a 2,900-square-foot Victorian-home upon founding his ranch in 1887. Today, Charles and Mary Ann Dyer Goodnight House in Goodnight, Texas, has recently been restored on its original site at the Charles Goodnight Historical Center. 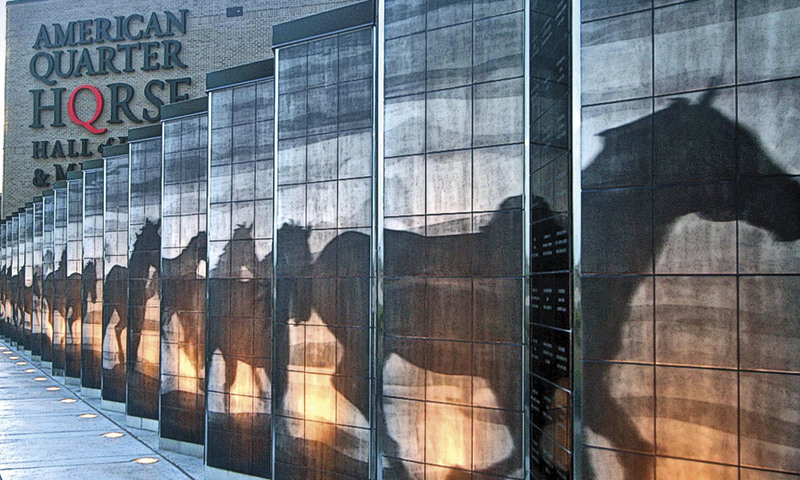 When on a cowboy and culture tour of the Texas Panhandle, don’t miss the chance to combine both experiences with a visit to the world-class American Quarter Horse Hall of Fame & Museum in Amarillo. Following U.S. 287 out of Fort Worth, you drive through cattle country. 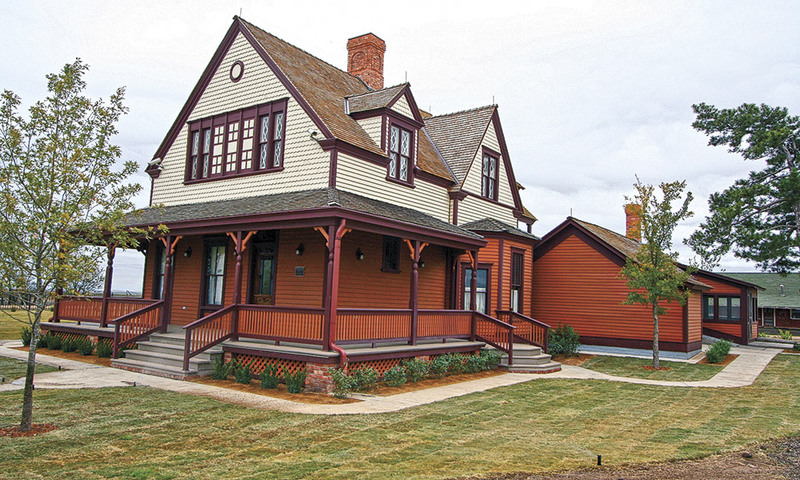 Before reaching Amarillo, check out the restored 1887 home of cattle king Charles Goodnight at the Charles Goodnight Historical Center near Claude. By the way, Claude’s Gem Theater opened as a movie theater in 1915, but today is a “presenting theatre” for the Texas Commission on the Arts. 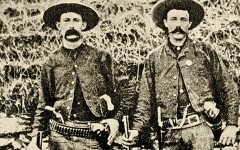 Of course, the major Panhandle cowtown in the late 1880s was Tascosa, where Billy the Kid sold stolen stock. But the Fort Worth and Denver Railway couldn’t lay tracks to Tascosa, and that’s why Amarillo thrives while Tascosa is a ghost town that’s home to Cal Farley’s Boys Ranch, open since 1938 for at-risk children ages 5 to 18. Think Amarillo doesn’t do culture or opera? Wrong. The Grand Opera House opened in 1909, and the Amarillo Opera has been a part of the city’s culture since 1989. The Panhandle-Plains Historical Museum is just down the road in Canyon, and the Amarillo Livestock Association remains one of the state’s largest independent auction houses. People here wear cowboy hats. And, yes, you can find a good steak—after an opera, too. Johnny D. Boggs has eaten much barbecue in Kansas City, consumed many cold beverages in Fort Worth and has even attended the world-famous Santa Fe Opera. The Suspect Savannah Strike Did the James-Younger Gang commit an 1867 robbery in Missouri? 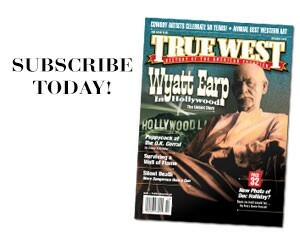 Why aren’t great supporting actors in Westerns shown respect?